I love, love, love getting comments from you! I love the community that we have here, and love that you are part of it! Thank you for hanging out with me! A couple of weeks ago, someone left a comment on my consignment sale post wanting to know what prices to pay for items. 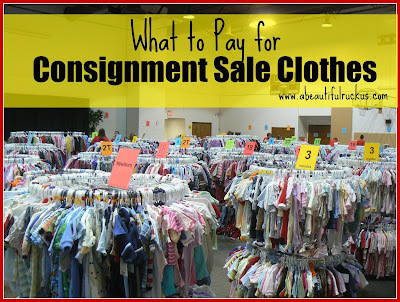 If you haven't figured it out yet, I'm a total consignment sale junkie! I actually break out into a cold sweat when I have to buy clothes at retail because the prices just seem astronomical for something my kids will only wear for a few months at most. So, after reading that comment, I sat down to try to figure out what my price range is on items. I'm going to share it with you, but please keep in mind that I'm in the midwest. Kansas City consignment sale prices are definitely going to be different from what you might pay on the east or west coasts. That doesn't mean that they aren't worth checking into in other parts of the country. It just means that you want to adjust your expectations accordingly. I also don't care about name brands, "new with tags" or "new without tags" clothes, or licensed characters. I have four kids the same size to shop for, so I go for mass quantities of inexpensive items. I need them to last one season, and then I'm finished with them. I resell what I can, but I also know that kids are rough on clothes, so I try not to overspend on something that might get ripped or stained. Other moms shopping the same sales may have a different budget, number of kids, or really like particular brands that sell for a bit more. So when you read through my list, keep in mind that these are the prices that I aim for in my part of the country. The prices noted below are what I've been paying since size 6 months. This spring, I'm shopping for size 24 months/2T, and I expect them to stay much the same. I typically pay on the lower end of the ranges, but I will go up to the top of the range if it's too adorable to pass up (little girls clothes are so hard to pass by!). For toys and big ticket items, I don't really have a range. I have been known to whip out my phone in the middle of a sale and do a quick search for the retail price though. You never know what kinds of awesomeness you'll come across in a consignment sale! It's true, I could probably find these same items cheaper at garage sales and thrift stores. I'm not opposed to shopping at those venues, but I don't have the time to devote to hit-and-miss shopping right now. At a consignment sale, I walk in knowing that the items are in good condition and that they will have clothes in the size I need. At some point, I'm hoping to branch out, but for the selection, price, and one-stop shopping, consignment sales are definitely the way to go! If you haven't checked them out yet, I can't recommend them enough! 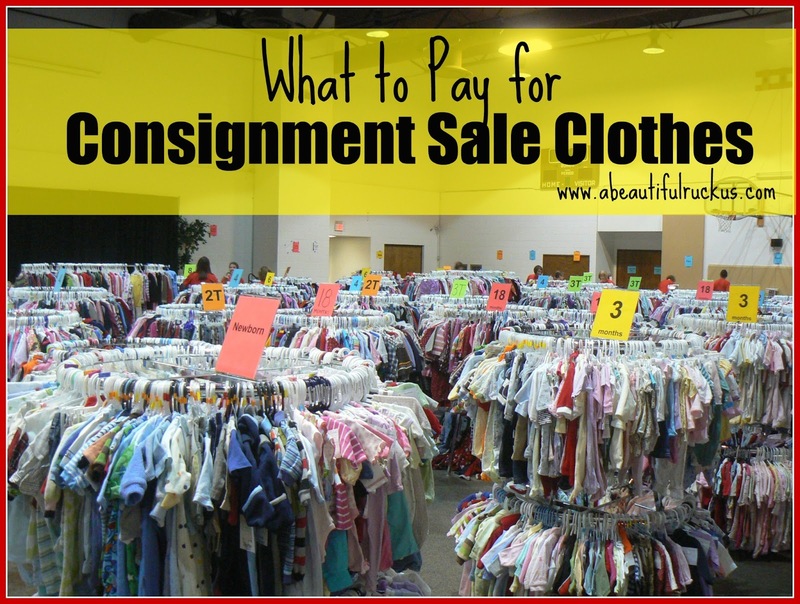 Don't forget to pin this post for future consignment sale shopping reference! My mom and I love consignment sales (and garage sales too). I play as little as possible, so my prices are probably similar to yours, although I will spend a tad bit more for items that are NWT, I just fall in love with, are special occasion, or pricier brands (because of the longevity, not the name brand factor). I only have one little one right now and we plan to have more, so lasting a few kids is a priority for us! Glad to see I'm not the only consignment sale junkie. Hehe! I liken it to a great big treasure hunt! Once you've experienced the rush (and the huge savings!) it's hard to go back to retail! Mom and I are going to our local Just Between Friends sale Saturday because it is half price day!!! It is time to stock up on boys clothes (the girls have adorable hand me downs to 2t, yay!!!!) I love love love consignment sales for the same reasons as you. I also give my sister a bit of cash so she can snag thrift store finds since she has time for bargain shopping. That's a brilliant idea to have family members help keep an eye out! Love it! Did you find anything good at the sale? Do share! Bummer! But even if the prices start increasing, it's STILL cheaper than retail. Here's hoping I get at least one more size using my lower price ranges! I've heard of Freecycle but don't know anything about it. I'm heading over to check out your post. Thank you! Great Post! Thanks for putting this together. My husband will coming with me (yes, really) so this will give him an idea of what to aim for the things he picks out too. I actually super excited for the local JBF sale. Garage sales are great but like you said they take a lot of time and energy. You might find that prices are higher at the JBF sales. The reason is because they take a greater commission out of those sellers checks than they do at our local multiples sale. Just caution him to adjust if it looks like the range is higher. I'd hate to see you not get anything because it's outside my range and then find yourself paying full price later! These look like pretty great ranges. Also good to keep in mind when pricing things to sell. Thanks for the post! Indeed! Another good measurement when pricing is to ask yourself, "What would I pay for this?" I also love to shop the consignment sales. I have found some great deals and pretty much buy all of my kids' clothes this way. Even in the KC area, I have found that as my kids get bigger the selection goes down and the prices start to go up. Most notably at the 24 mo/2T mark. I'm glad you said something so that I can adjust my expectations a bit. It doesn't surprise me that they go up a bit (but I like to hope that they stay super low anyway!)! Another good tip: many kids' consignment sales also have maternity clothes for mamas-to-be. I was pleasantly surprised to discover this when I was pregnant with my first baby. I snagged some awesome deals on maternity clothes at several sales ($3-$5 for dress pants, $5-$7 for dresses) and they were all in great condition! I didn't want to spend a lot of money on clothes I'd only wear for a few months, so these sales were a godsend! And they're awesome for kid stuff, too. Much easier than dealing with yard sales. Your price range isn't bad for the East Coast! I might pay a bit more, but not that much. We have a few grea consignment shops around here that also cut prices by dates... I try to never pay full price at those places. (Last week I found a fill-a-bag sale for $10. We got 7 pairs of pants, 8 shirts, 2 dresses and a pair of pjs!) I only shop for one, but I cannot imagine paying full price! Wow! All that for only $10?? That's awesome! It makes me want to go find fill-a-bag sales now!